It's been awhile since I've made a card that's just for me. I've been spending so much time planning projects for my girls that I haven't really had time to craft "just for me", you know? I fashioned the flower embellishment using a technique I picked up at the Baltimore Regional last fall using 1 1/4" striped grosgrain (this one is in Riding Hood Red from the clearance rack and is an absolute STEAL at only $1.99 per roll), layered with Victoria Ribbon using the same technique. After each layer was sewn and gathered together individually, they were both fastened together with an Antique Brad. For the background, I pulled out my beloved and retired French Script background stamp (for a currently-available alternative, check out En Francais.) I stamped the background in Versamark and Chalked it with my Stampin Pastels in Very Vanilla - to see this better, click on the first picture to enlarge the photo to see more detail. This card also uses my oh-so-favorite Cherry blossoms from the Easter Blossoms set in the occasions mini. April is the last month of the Occasions mini, so if you don't get this stamp set now, you may never have another opportunity. Anywho, toss in a mishmash of a few of my favorite reds (Riding Hood Red cardstock, Poppy Parade Marker and Cherry Cobbler ink for the sentiment), and some Basic Pearls and this card is done! I'm finding it's really a challenge striking a balance between the business side of crafting and the personal side of it. I'm really happy I took some time out from the planning and kitting to make this card that is so very "Michey". Looking at it makes me smile and serves as a little reminder to not forget the "me time". Accessories: Stampin Pastels, 1 1/4" Striped Grosgrain in Riding Hood Red, Victoria Crochet Trim, Antique Brads. LOL & eeeewwwwww about the skunk in a blender!! I do love your card. Thanks for the giggle. Wow! Very pretty, I really like the little ribbon rosette. oooh I love this!! beautiful job. hugz n blessings. Gotta remember that "me" time. So important. Lovely card. And if you ever want to do a Challenge,(they are so much fun) I am doing a challenge blog with a SU friend called A La Card Monkey, this week is a Easter challenge and we are also giving away Blog candy when we reach 300 followers. www.alacardmonkey.blogspot.com ... We would love to have you come do a challege with us! Gorgeous card!! I know, I snagged me some clearance ribbon too, LOL!! You make beautiful creations on your blog!!! 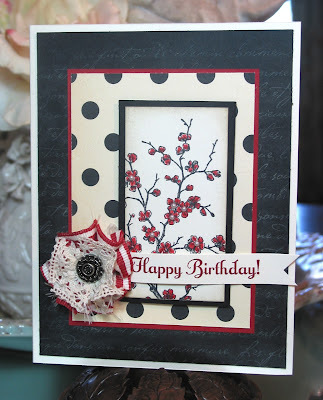 What a gorgeous card Michey! Very striking colour combo and fabulous details like the flower and chalking! I've just got the French Script bg stamp, I really like the handwritten look of it, En Francais seems rather formal to me. Absolutely stunning, Michey! 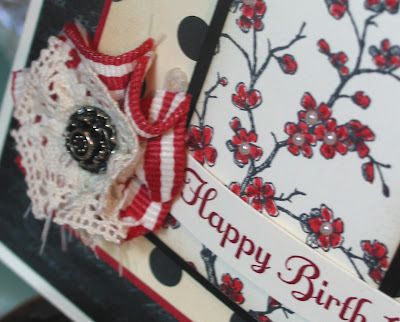 I LOVE the ribbon and lace rosette!